Jiuzhaigou Valley (Simplified Chinese: 九寨沟; Traditional Chinese: 九寨溝; pinyin: Jiǔzhàigōu; lit. "Valley of Nine Villages;" Tibetan: Sicadêgu) designates a nature reserve in the northern Sichuan province of China. Known for its many multi-level waterfalls and colorful lakes, UNESCO declared it a World Heritage Site in 1992. It belongs to the category V (Protected Landscape) in the IUCN system of protected area categorization. Sitting on major fault lines of the Qinghai-Tibet Plate and the Yangtze Plate, earthquakes that shape the landscape, creating the magnificent beauty of the region also can inflict great loss of life and property. In the May 2008 earthquake, the Jiuzhaigou Valley Scenic area sat over 200 kilometers from the epicenter, escaping damage. The Giant Panda population in Jiuzhaigou Valley, which numbers around twenty, escaped unharmed. UNESCO designated Jiuzhaigou Valley a World Heritage site in 1992, by virtue of its unique and exceptionally beautiful systems of lakes and waterfalls, as well as fauna. In 1997, UNESCO designated the region a World Biosphere Reserve, highlighting the complex and delicate biosphere. One thousand Tibetan and Qiang Chinese live in the valleys. They have lived within the region for generations, considering the valley the place where God lives. Traditionally, they made their living within the area by farming and herding yak. The Tibetans and Qiang who live in the villages have been required to cease husbandry since the valley became a World Heritage Site and designated World Biosphere Reserve, even though their activities posed no threat to the environment. That can not be said for the thousands of visitors who visit the valley daily. The steady increase of tourists each year has threatened the environment, putting the survival of the Giant Panda and the Golden Snub-nosed Monkey, both endangered species, in question. Tourism has increased from 5,000 patrons a year in 1984, when the park first opened, to 1,190,000 tourists in 2002. In 2004, the average daily number of visitors reached 7,000 or 2,555,000 visitors. Only 3000 of those visitors came from other countries. As the number of tourists who make the arduous journey to view the natural splendors of park increases, the delicate nature of the site will come under greater threat. Jiuzhaigou lies at the southern end of the Minshan mountain range, 330 km north of the provincial capital of Chengdu. Part of the Jiuzhaigou County (formerly Nanping County) in the Aba Tibetan Qiang Autonomous Prefecture of northwestern Sichuan province, it sits near the Gansu border. The valley covers at least 240 km², with some protection organizations giving the area as 600 to 720 km², with buffer zones covering an additional 400 to 600 km². Its altitude, depending on the area considered, ranges from 1,998 to 2,140 m (at the mouth of Shuzheng Gully) to 4,558-4,764 m (on Mount Ganzigonggai at the top of Zechawa Gully). With a cool climate, the temperate has a mean annual temperature of 7.2°C, with means of -1°C in January and 17°C in July. Total annual rainfall is 661 mm, 80 percent of which occurs between May and October. Tibetan and Qiang peoples inhabited the remote region for centuries, although not officially discovered by the government until 1972. Extensive logging took place until 1979, when the Chinese government banned such activity and made the area a national park in 1982. The government established an Administration Bureau and the site officially opened to tourism in 1984. Architects completed the layout of facilities and regulations in 1987. UNESCO designated the site a World Heritage Site in 1992, and a World Biosphere Reserve in 1997. Since opening, tourist activity has increased every year: From 5,000 in 1984 to 170,000 in 1991, 160,000 in 1995, to 200,000 in 1997, including about 3,000 international tourists. Visitors numbered 1,190,000 in 2002. As of 2004, the site averages 7,000 visits per day, with a limit of 12,000 allowed during high season. The Town of Zhangzha at the exit of the valley and the nearby Songpan County feature an ever-increasing number of hotels, including several polished five-stars. Jiuzhaigou takes its name from the nine Tibetan villages along its length. Few of them remain today, depending on what classifies as "a village inside the valley." The following villages still exist: Heye, Shuzheng and Zechawa along the main paths, plus Rexi and Heijiao in the smaller Zaru Gully. Maps also indicate villages named Jianpan, Panya and Guwa near the end of a small gully opposite Zaru. Finally, the Penbu, Panxing and Yongzhu villages lie along the road that passes through the town of Jiuzhaigou/Zhangza outside the valley. In 1997, the permanent population of the valley hovered about 1000, made up of about 130 Tibetan and Qiang families. Due to the protected nature of the park, agriculture activities have been prohibited, the residents relying on government subsidies as well as tourism. 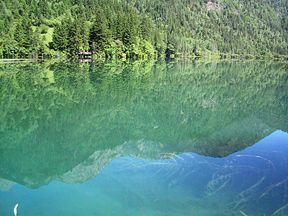 Jiuzhaigou's ecosystem classifies as temperate broad-leaf forest and woodlands, with mixed mountain and highland systems. Virgin mixed forests cover nearly 300 km² of the core scenic area. Those forests take on attractive yellow, orange, and red hues in the autumn, making that season a popular one for visitors. They serve as home to a number of plant species of interest, such as endemic varieties of rhododendron and bamboo. Local fauna includes the endangered Giant Panda and Golden Snub-nosed Monkey. Both have very small populations(less than 20 individuals for the pandas) and live isolated. Their survival remains in question in a valley subject to increasing tourism. Jiuzhaigou supports approximately 140 bird species. High-altitude karsts shaped by glacial, hydrological and tectonic activity make up Jiuzhaigou's landscape. It lies on major faultlines on the diverging belt between the Qinghai-Tibet Plate and the Yangtze Plate, and earthquakes have also shaped the landscape. Carbonate rocks such dolomite and tufa, as well as some sandstone and shales, mostly make up the rock strata. The valley includes the catchment area of three gullies (which, due to their large size, many call valleys themselves), and serves as one of the sources of the Jialing River, part of the Yangtze River system. Dozens of blue, green and turquoise-colored lakes constitute Jiuzhaigou's best-known feature. The local Tibetan people call them "Haizi" in Chinese, meaning "son of the sea." Originating in glacial activity, rockfalls and other natural phenomena dammed them, then solidified through carbonate deposition. Some lakes have a high concentration of calcium carbonate, making their water so clear people can see the bottom even at high depths. The lakes vary in color and aspect according to their depths, residues, and surroundings. Some of the less stable dams and formations have been artificially reinforced, and the government forbids tourists direct contact with the lakes or streams. Three valleys arranged in a Y shape shape Jiuzhaigou. The Rize and Zechawa gullies flow from the south and meet at the center of the site where the form the Shuzheng gully, flowing north to the mouth of the valley. 55 km of roads for shuttle buses, as well as boardwalks and small pavilions, line the mountainous watersheds of those gullies. The boardwalks, typically located on the opposite side of the lakes from the road, shield them from disturbance by passing buses. Most visitors will first take the shuttle bus to the end of Rize and/or Shuzheng gully, then make their way back downhill by foot on the boardwalks, taking the bus instead when the next site is too distant. A summary of the sites found in each of the gullies follows. The Primeval Forest (原始森林 Yuánshǐ Sēnlín), a preserved ancient woodland, with spectacular views of the surrounding mountains and cliffs, including the 500 m high blade-shaped Sword Rock (剑岩 Jiàn Yán). Swan Lake (天鹅海, Tiān'é Hǎi), a 2250 m long, 125 m wide picturesque lake named for its visiting swans and ducks. Grass Lake (草海, Cǎo Hǎi), a shallow lake covered in intricate vegetation patterns. Arrow Bamboo Lake (箭竹海, Jiànzhú Hǎi), covering an area of 170,000 m². A shallow lake with a depth of 6 m, it lies at an elevation of 2,618 m. The 2002 Chinese film Hero had been shot on location. Panda Lake (熊猫海, Xióngmāo Hǎi) features curious color patterns of blue and green. It empties into the multi-stream, multi-level Panda Waterfalls, dropping 78m in three steps. Five Flower Lake (五花海, Wǔhuā Hǎi), a shallow multi-colored lake with ancient fallen tree trunks criss-crossing the bottom. Pearl Shoal (珍珠滩, Zhēnzhū Tān), a wide, gently sloping area of active calcareous tufa deposition covered in a thin sheet of flowing water. It empties into the famous Pearl Waterfalls, where the shoal drops 28 m in a 310 m wide broad curtain of water. A scene of the television adaptation of Journey to the West had been filmed there. Mirror Lake (镜海, Jìng Hǎi), another quiet lake, casts beautiful reflections of the surroundings on its calm waters. Long Lake (长海, Cháng Hǎi), the highest, largest and deepest lake in Jiuzhaigou, measuring 7.5 km in length and up to 103 m in depth. It reportedly has no outgoing waterways, getting its water from snow melt and losing it from seepage. Local folklore features a monster in its depths. 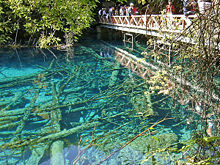 Five-Color Pond (五彩池, Wǔcǎi Chí), one of the smallest but most spectacular bodies of water in Jiuzhaigou lakes. Despite its very modest dimensions and depth, it has a richly colored underwater landscape with some of the brightest and clearest waters in the area. The Seasonal Lakes (季节海, Jìjié Hǎi) constitute a series of three lakes (Lower, Middle and Upper) along the main road, that change from empty to full during each year. 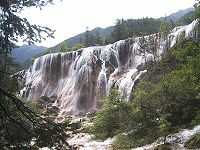 Nuorilang Falls (诺日朗瀑布, Nuòrìlǎng Pùbù), near the junction of the valleys, 20 m high and 320 m wide, reportedly the widest highland waterfall in China, and one of the symbols of Jiuzhaigou. Nuorilang Lakes (诺日朗群海, Nuòrìlǎng Qúnhǎi) and Shuzheng Lakes (树正群海, Shùzhèng Qúnhǎi) constitute a stepped series of respectively 18 and 19 ribbon lakes formed by the passage of glaciers, then naturally dammed. Some of them have their own folkloric names, such as the Rhinoceros, Unknown, and Tiger lakes. Sleeping Dragon Lake (卧龙海, Wòlóng Hǎi), one of the lower lakes in the area, has a depth of 20 m. Notable for the clearly visible calcareous dyke running through it, its shape has been compared to a dragon lying on the bottom. Reed Lake (芦苇海, Lúwěi Hǎi), a 1375 meter long, reed-covered marsh has a clear turquoise brook zigzagging through it. The contrast presents a particularly striking scene in the autumn when the reeds turn yellow. The Zaru Gully (扎如沟, Zārú Gōu), a smaller valley that runs southeast from the main Shuzheng gully; it begins at the Zaru Buddhist monastery and ends with the Red, Black, and Daling lakes. The Fairy Pool (神仙池, Shénxiān Chí) lies 42 km west of Jiuzhaigou and features travertine pools very similar to those of the nearby Huanglong Natural Reserve. Jiuzhaigou, compared to other high-traffic scenic spots in China, presents a notoriously difficult access by land. Most tourists reach the valley by a ten hour bus ride from Chengdu along the Minjiang River canyon, prone to frequent rock slides and mudslides that can add several hours to the trip. As of 2004, the construction of a new highway which, when completed, should greatly facilitate the journey, has incurred further delays. Since 2003, it has been possible fly from Chengdu or Chongqing to an airport on a 11311 ft. high mountain side near Songpan County, and then take an hour-long bus ride to Jiuzhaigou, or a two-hour bus ride to Huanglong. From 2006, a daily flight to Xi'an had been opened in peak season. A new heliport has been built near the valley. ↑ China View, China Focus: Massive China quake heavily mauls tourist paradise. Retrieved July 7, 2008. ↑ United Nations Environment Program, Homepage. Retrieved July 7, 2008. Nianyong, H., Z. Qian, and Z. Hong. 2008. "From experiences to institution: The management of Jiuzhaigou Valley Biosphere Reserve faced with institutional transformation and upgrading." International Journal of Environment and Sustainable Development 7(2): 145-155. Yenzhou, Ze. 1999. World Natural Heritage: China Jiuzhaigou Valley. China: Wanhai Books. ISBN 9787503211027. Yu, Ning. 2000. 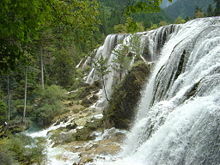 Jiuzhaigou = Jiuzhaigou Valley. Beijing: Zhongguo lü you chu ban she. ISBN 9787503217333. Ze, Renzhu. 1998. Zhongguo Jiuzhaigou = China Jiuzhaigou Valley. Beijing: Zhongguo lu you chu ban she. ISBN 9787503211027. 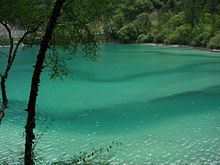 Jiuzhaigou at the World Heritage Sites of UNESCO. This page was last modified on 8 May 2018, at 21:51.